Home » What is your ticket sign? What is your ticket sign? Early Birds are visionaries. They know what they want and plan in advance. They are not afraid to make decisions now, they know that if their plans change later, they can adjust. 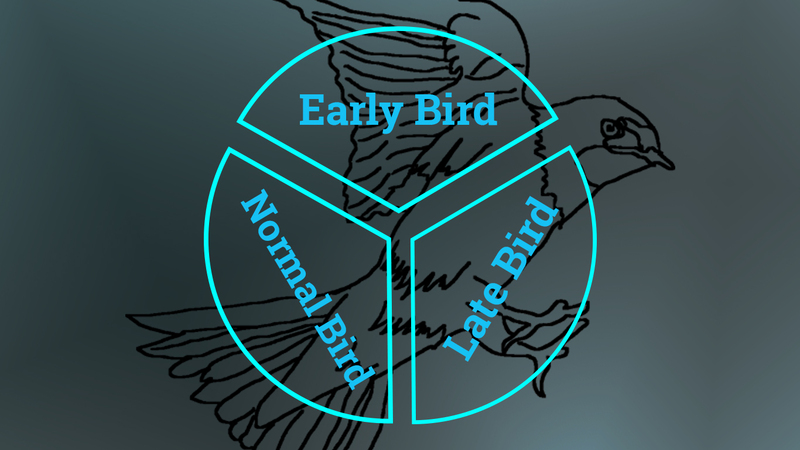 Money Early Bird is in for serious money saving by booking by 12 June. Love Well-placed signs of affection towards MyData social media accounts guide Early Birds to find love. Friends Visionary Early Birds inform their less-visionary friends to gain the respect and appreciation of their flock. Normal Birds are nothing but ordinary. Normal birds are informed and prudent. There have been some disturbances on their way, but those are now behind. Money The newsletter did not reach Normal Birds and this caused a little hassle with money. Luckily Normal Birds are now back in control of their financial situation! Love With activities in the financial areas of Normal Birds’ lives, summer is a good time to enjoy the love letters they have now subscribed to. Friends Even though summer holidays might make Normal Birds feel alone, they can remain calm and prepare to gain a bunch of new friends in the autumn in Helsinki and Tallinn. Late Birds are impulsive. They get excited quickly and are not afraid to make decisions at the last minute. Adrenaline keeps Late Birds running – they just need to remember to ease off some times. Money Unfortunately, algorithmic waves have not favoured Late Birds, as they missed the discount letters. This might hurt now, but pays off later. Love It’s never too late, not even for Late Birds, to get some loving! In August, a lot of MyData love will be coming their way. Friends Instead of focusing too much on finances, Late Birds should focus on making sure they participate in the evening programme as much as they can.